Four New York society couples have been invited to the tenth wedding anniversary celebration of Deputy Mayor Charley Brock and his wife Myra at their country home north of the City. But, as the guests begin to arrive, something is amiss. All of the house staff have disappeared, Myra Brock is nowhere to be seen, and Charley is found in a stupor on the edge of his bed, covered in blood, and holding a recently fired handgun. In a classic comedy of errors, the first arrivals (a married couple, lawyers by trade) are unsure of what’s happened, but are determined to cover it up. As successive pairs arrive, each with their own personal and/or political agendas, the intrigue deepens. With each couple maneuvering to simultaneously support the coverup and distance themselves from it, it’s a sticky morass demanding a truly magnificent and miraculous resolution. Friday, February 27, 7:30 p.m.
Saturday, February 28, 2:00 p.m. and 7:30 p.m.
Sunday, March 1, 2:00 p.m. 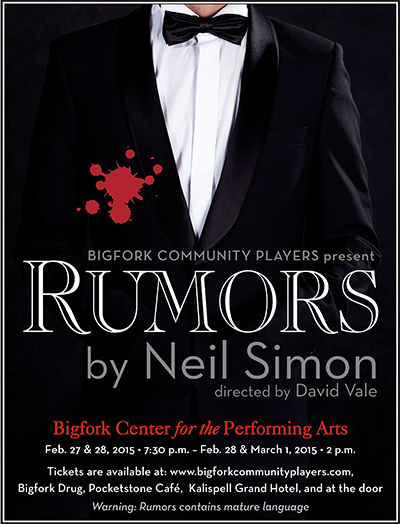 Rumors contains mature language. Parental discretion is advised.